Ireland pictures from Achill Island and Co Mayo, Ireland. These picture galleries on Achill 24/7 show photographs taken on Achill Island and surrounding areas in County Mayo on the remote west coast of Ireland. Gallery 3 features pictures from Burrishoole Abbey, Co Mayo, Ireland. Burrishoole Abbey is located on the north side of Clew Bay, Co Mayo, between Newport and Mulranny. This building, the remains of a Dominican Friary dedicated to St. Mary, dates from around 1470. It was built for the Dominicans by Richard de Burgo, MacWilliam Iochtar. Formal recognition for the Friary came from the Pope in 1486. 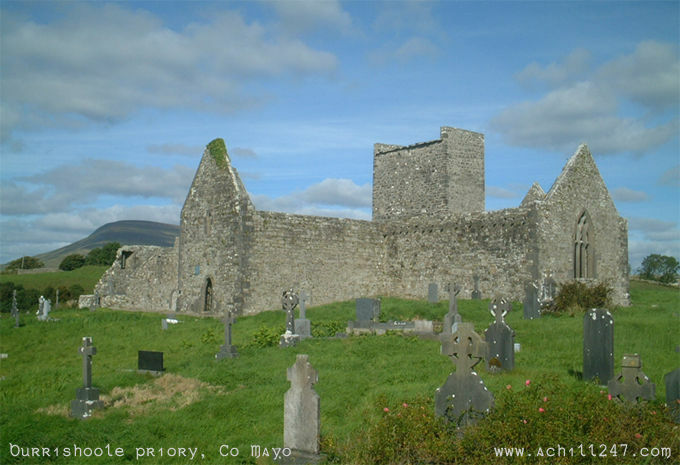 All that remains from the Friary is the church (pictured, below) and the eastern wall of the cloister.